Peel and dice the Onion; peel and crush the Garlic. Heat the Oil in a medium-size skillet. Sauté the diced Onion, crushed Garlic and the Rice in the Hot Oil. 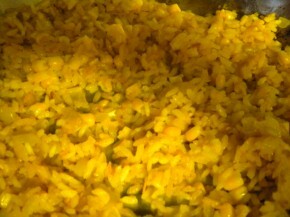 When the Rice begins to brown, stir in the Tomato Sauce and Salt and Pepper. Add the Liquid, stir and cover tightly; when the mixture begins to gently boil, turn the heat down to low. Stir in the Corn and Carrots and continue cooking uncovered for 5 minutes longer.